In the book “Living Well” I explore two models , one is a model of wellness , and the other is the model of unwellness . Once we see how this model works , we can understand why some people remain well always , and why some people are always found unwell. Because Wellness , requires to do certain things , in a certain way , and it is a thought process , which helps to move even beyond the thoughts .So while we go through this book , exploring the fundamental principles of well being , and how one mind can move inward , by practise of Surya Yoga , Surya Dhyana , Surya Kriya and finally with right food and nutrition practices, and reach to those exalted and subtle state of mind, which gives a sense of wellbeing, and makes one happy and well, we also understand what creates unwellness , disease and unhappiness in us, and learn to avoid them. • Wellness Yoga ( Surya Yoga , Surya Kriya , Surya Dhyana and Food and Nutrition practices ) and strategies for keeping our practice and application of mindfulness and wellness going, and ways to deepen it. •Obstacles that people commonly experience at the end of to keep them well and becomes unwell , and ways to work around them. •Broader implications of wellness, such as its effects on creating more deeper experience and realising one’s own self and deep sense of peace and liberation from the condition he is subjected to. 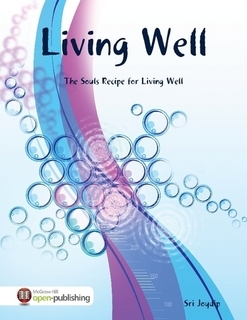 Living Well is a journey towards deep diving on the Soul’s recipe of Wellness, Well-being, and Happiness.It also describes, and give details on different meditative and Cognitive practices , Yoga therapy , Yoga of Food and Nutrition. These are essential steps, one should practice to live Well.The Book could be an ideal companion,for all those who want to live well,in there life.